Storage Services - VIP Transport, INC.
Our storage and warehousing facilities are safe and secure and equipped for your long term or short term needs, as well as large warehousing and distribution projects. 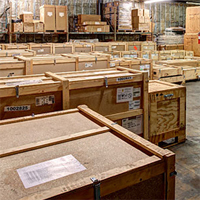 Additionally, VIP provides climate controlled storage facilities with minimal UV lighting, ensuring maximum protection for items such as fine art or sensitive storage items. We also provide private wine storage areas. Our network affiliation with UniGroup provides over 1,100 locations in the US, allowing us access to over 24 million square feet of regulated warehousing and storage facilities. This network also includes partnerships with 1,350 international locations, which encompasses 46 million square feet of warehousing, 7 million square feet of which is climate controlled. VIP Transport’s locations are all military approved and are required to have regular inspections. Our Corona, CA facility includes over 160,000 square feet of storage and private climate control storage rooms.